This article is about the comic series. For the original novel, see Halo: The Fall of Reach. Halo: Fall of Reach is a series of three four-issue comic book adaptations of the first Halo novel, The Fall of Reach. It was published by Marvel Comics. The series consists of three story arcs: Boot Camp, covering John-117's childhood and Spartan training; Covenant, centering around the early days of the Human-Covenant War; and Invasion, adapting the final sections of the novel, including the eponymous battle. 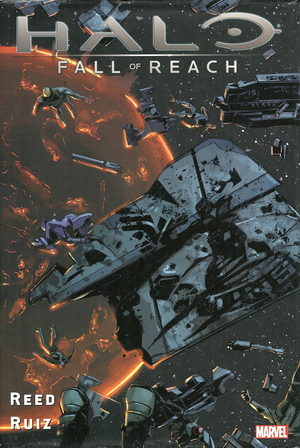 Halo: Fall of Reach was collected in arcs - as three separate four-issue hardcovers, as well as a twelve-issue hardcover collected edition on October 17, 2012. A trade paperback version was released by Dark Horse Comics on March 16, 2016. The series shows some of the first visuals for canon elements never seen outside of the Fall of Reach novel. As the series is adapted to the comic book medium, it differs from the original book in a variety of ways; some details are fleshed out more than in the novel, while others are left out or altered for storytelling purposes. For example, the series adds a subplot which expands upon the background of the character Robert Watts, a turncoat colonel and the leader of the Eridanus rebels. Additionally, the final segment of Invasion adds an embellished interpretation of Red Team's actions during the Fall of Reach as described in Halo: First Strike. The series also takes a number of artistic liberties with the material; for instance, several ships (such as the Unrelenting) appear different than described in the novel, and the canonically pitch black slipspace is depicted as an expanse of blue streaks. Additionally, the space battles are portrayed as occurring over much shorter ranges than the described in the novels—often only several dozens or hundreds of meters at the most as opposed to the distances routinely ranging from several kilometers to hundreds or even thousands of kilometers in the novels. Brian Reed worked with Frank O'Connor and Kevin Grace of 343 Industries to ensure the accuracy of the additional content, and the content updates in the 2010 version of The Fall of Reach have been taken into account in the comic series. “ The legend of Master Chief begins! The United Nations Space Command is engaged in a brutal battle against a growing tide of insurrection. Desperate times call for desperate measures, and under the threat of a prolonged war the UNSC initiates the SPARTAN-II Project, a military program seeking to create a squad of super-soldiers. And so a great adventure begins: Once, he was a 6-year-old boy named John. But his superior speed, intelligence and adaptability to the SPARTAN-II training allow him to rise above the rest, starting his journey to become the most legendary warrior the galaxy has ever known! Halo: Fall of Reach - Bootcamp begins the adaptation of Eric Nylund's novel Halo: The Fall of Reach, based on the international videogame sensation Halo!